OXFORD, Ohio – Groundhog Day should’ve been on Saturday instead of Friday. 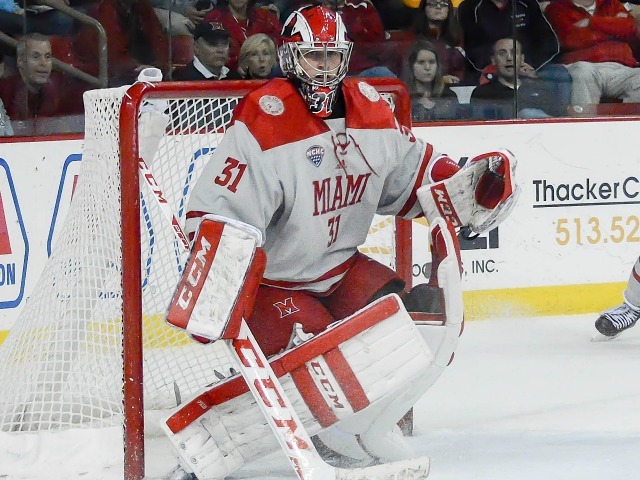 Miami, seemingly caught in a never-ending loop of evaporating leads, yet again saw a two-goal advantage vanish in a 3-2 loss to Western Michigan at Cady Arena on Saturday. A sweep of the Broncos that would have seen the RedHawks climb to within a game of .500 instead ended in a mercurial weekend split. After playing so well on Friday and taking a 2-0 lead on Saturday, holding that advantage would’ve pulled Miami within four points of an injury-plagued WMU team that is without its best offensive weapon. The Broncos would’ve been in a three-way tie for fourth place, and finishing in the top four in this conference is so important because it means home-ice advantage for the NCHC Tournament. Instead, Miami is now 10 points behind WMU, and with eight games left, closing that gap will be nearly impossible with the RedHawks’ remaining schedule. RECAP: The RedHawks caught an early break, as a Western Michigan goal midway through the first period was waved off after a review because it was determined the play was off-side. Carter Johnson celebrates after scoring his first career goal (photo by Cathy Lachmann/BoB). Miami took advantage, as in the final minute of the opening frame, Casey Gilling whipped a shot just under the crossbar on the near side to put his team ahead. The RedHawks went up by two when Carter Johnson tipped home a blue-line blast by Louie Belpedio at the 1:46 mark of the second period for his first collegiate goal. But the Broncos ran off three straight goals in that decisive middle stanza. Ethen Frank streaked through the slot, took a feed from Austin Rueschhoff and beat Miami goalie Ryan Larkin on his backhand less than two minutes later to make it 2-1. Western Michigan tied it with exactly four minutes left in that frame on another Frank goal. Frank was a trailer on a 2-on-2, and he took a pass in the high slot from Dawson DiPietro and buried it. Just 74 seconds later, the Broncos took their first lead of the weekend when Lawton Courtnall stole the puck from Conor Lemirande, went coast-to-coast and beat Larkin on the glove side from the slot. Miami outshot WMU, 8-0 in the third period and had 7:36 of power play time but was unable to generate the equalizer. THOUGHTS: From its highest-profile games to Saturday, damage control has been a decade-long issue for Miami teams. Once again, a pair of critical goals against occurred in quick succession. – Game 2: Kasper Bjorkqvist scored the game winner one second left to lift Providence to a 2-1 win. – Game 8: Miami led 1-0 after one period, Colorado College tied it in the second and Westin Michaud netted the winner in the final second of the second period. – Game 11: Miami and Minnesota-Duluth were tied, 1-1 late in the third period, but Jared Thomas and Scott Perunovich found the net 76 seconds apart as the Bulldogs won, 3-1. 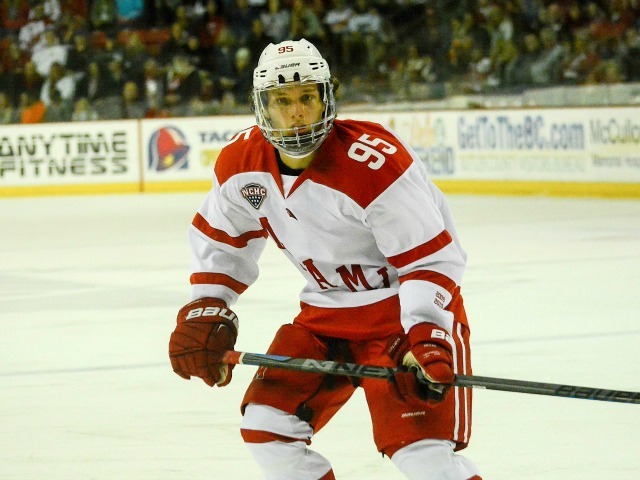 – Game 14: Miami was 36 seconds away from a win and sweep at Bowling Green, but Alec Rauhauser found the net with the extra attacker as the Falcons salvaged a 2-2 tie. 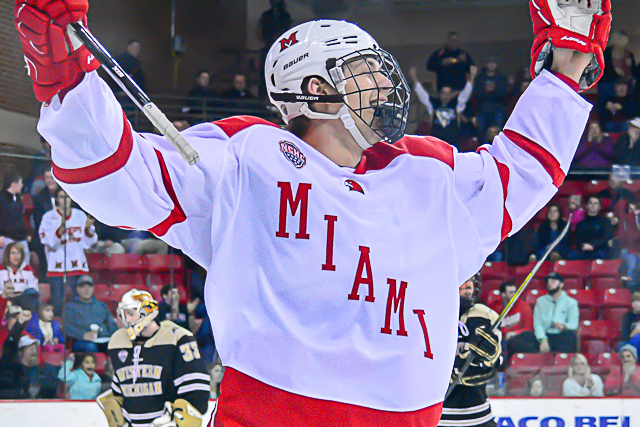 – Game 18: Like this weekend, Miami had beaten Western Michigan in the opener in Kalamazoo. But in the finale, the RedHawks blew a 3-1 lead as Wade Allison recorded a natural hat trick, cutting the deficit to one midway through the second period, tying it with 4:02 left in regulation and winning it in overtime. – Games 21-22: Not blown leads but just pointing out how Miami has let games get away. In Game 21, UNO ran off 11 goals vs. Miami, a quarter-century worst mark for the RedHawks, and the Mavericks scored consecutive goals 41 seconds and seven (!!!) seconds apart. The next night, UNO scored four times in a 10:53 span of the second period, and the RedHawks tried to come back but fell short, 4-3. Three of those goals against were in a 5:13 window. – Game 24: Another blown two-goal lead. Miami led, 4-2, but Colorado College cut the deficit to one late in the second period and Trevor Gooch tied it midway through the final stanza. – Game 26: Miami was ahead, 2-0 but allowed the final three goals in the second period, including two 74 seconds apart. — Weird that WMU was whistled for too many men twice in the first 3:18 minutes of the first period. — Miami actually held the Broncos without a SOG the entire third period. FORWARDS: C. Congratulations to Johnson for his first career goal on a sweet tip-in, and this corps – as well as the entire team – was solid for the first half of the game but seemed to run out of gas down the stretch. Gilling’s goal was a snipe, and it’s pretty obvious he’s going to be a major part of this team for the next three-plus years. Lemirande’s turnover hurt on the third goal, and it’s been a recurring theme that trailers have scored against Miami because no one has picked them up. DEFENSEMEN: B-. A decent but not great night for the corps. Louie Belpedio picked up assists on both Miami goals. Western Michigan did miss a few Grade-A chances and hit multiple posts. The trailer issue applies to the blueliners as well. Miami has gotten burned far too many times this season when opponents have entered the zone unabated. GOALTENDING: D+. Larkin only made 13 saves and should’ve made at least one stop on the three WMU goals. He does see a lot of Grade-A chances but Miami needs him to stop more pucks. 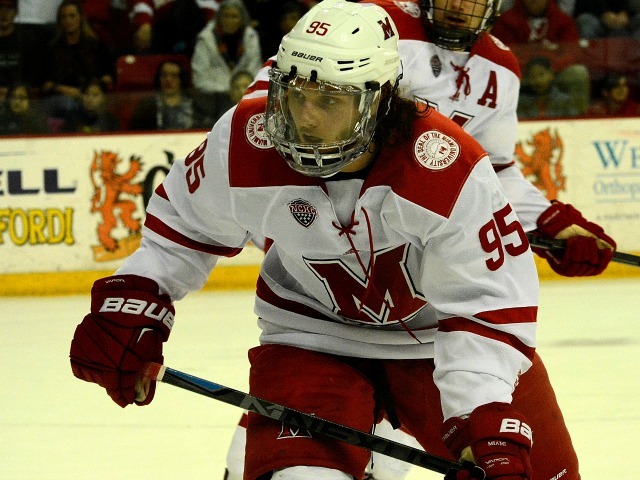 FINAL THOUGHTS: A 6-2 finish or better is the only way Miami could re-gain at-large consideration after yet another blown lead costs this team valuable league points and costs the RedHawks in the PairWise. The RedHawks are now 25th and would need to be over .500 to earn a berth. Miami isn’t as talented as some of the teams in this conference but as documented above, it should have a better record than 10-13-3. The window is closing quickly for the RedHawks, who will host a St. Cloud State team that is No. 2 in the PairWise. OXFORD, Ohio – The Mel Man definitely delivers late. Josh Melnick scored the tying and game-winning goals – with the latter coming in overtime – both on a power play stemming from a major penalty as Miami edged out No. 20 St. Cloud State, 3-2 at Cady Arena on Friday. Miami’s Josh Melnick (37) bangs home the game-winning goal in overtime (photo by Cathy Lachmann/BoB). Melnick had scored one goal in the first 16 games of the season but has found the net in three straight, with four tallies overall in that stretch. It was also the first multi-goal game of the sophomore’s career. The game was scoreless until 6:13 remained in the second period, when the Huskies’ Mikey Eyssimont corralled a loose puck in the slot and fed Patrick Newell on the side of the net, and after RedHawks goalie Ryan Larkin denied the initial point-blank backhander by Newell, Eyssimont was there at the side of the net to jam home the rebound. The goal by St. Cloud State (9-9-1) was the only marker of the contest until the final nine minutes of regulation and overtime, which more than made up for the first 51 low-scoring minutes. Miami’s Carson Meyer tried to put a shot on from a bad angle, but it hit a sliding defender. The puck bounced right back to Meyer at the side of the net, and he centered one to Anthony Louis in the slot, and Louis buried the one-timer through the five hole to tie it with 8:14 remaining. After the RedHawks’ Colin Sullivan was assessed a minor for cross checking, Eyssimont sent a cross-ice pass to Jacob Benson, who ripped one off the post. The rebound popped into the air and hit the chest of teammate Blake Winiecki, who tapped the puck in to give the Huskies a 2-1 lead with 2:59 remaining. Thirty-four seconds later, Benson was kicked out of the game for contact to the head of Meyer for an open-ice hit. And Melnick took it from there. An offensive-zone pass by Kiefer Sherwood hit a St. Cloud State skate and came back to Sherwood, who threaded a pass through traffic to a wide-open Melnick at the side of the net, and Melnick hammered it home to tie the score on a 6-on-4 with 56 seconds left in regulation. At the 1:23 mark of overtime, Louis put a close-range shot on net, and the rebound popped out to Melnick, who made a quick toe drag before whipping the puck into the cage to win it. It was the third straight win for Miami (6-8-5) following an 0-7-3 stretch, and the RedHawks are now unbeaten in their last four – their longest such span since last January. They have gone to overtime in eight of their 19 contests, winning three and tying the other five. Since its lowest point, Miami has climbed 11 spots in the PairWise rankings – used to determine NCAA Tournament seeding – to 29th, and while MU remains in seventh place in the NCHC, it is just two points behind Nebraska-Omaha and three back of SCSU with a chance to tie the Huskies with a win on Saturday. Melnick has five points during his current three-game points streak (4-1-5) and has three multi-point games in his last six. Louis finished with a goal and an assist, giving him points in four consecutive contests (2-3-5). He moved into solo control of 42nd place on Miami’s all-time points leaderboard with 110, passing former long-time NHLer Brian Savage. Meyer has the longest points streak on the team at six games, going 3-5-8 since coming back from an illness. He has recorded a helper in four straight. 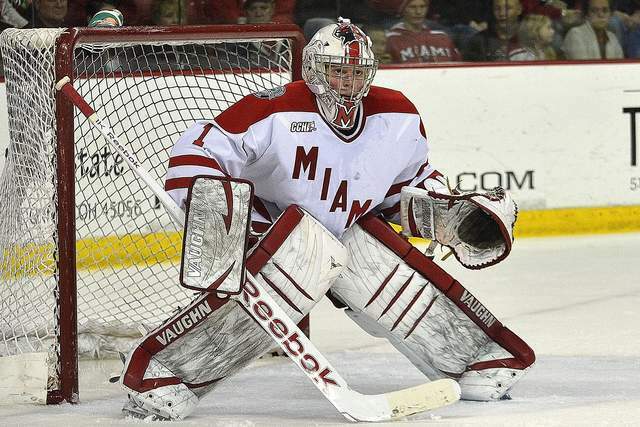 Ryan Larkin stopped 29 shots to earn the win for Miami. Is it too early to schedule watch? Especially since we’re in the online world, the answer is a definite ‘no’. Besides, there are only five games left in the regular season and all of them will be important for Miami, which beat Western Michigan, 4-1 at Lawson Ice Arena in Kalamazoo on Friday. Thanks to that win, the RedHawks are currently in a three-way tie for fourth with Nebraska-Omaha and Minnesota-Duluth — both of whom lost on Friday — and that No. 4 spot is paramount if Miami wants to qualify for its 10th NCAA Tournament in 11 years. As opposed to missing it for the second time in three seasons. North Dakota and St. Cloud have run away with the top two spots. The RedHawks can’t even mathematically catch either team. And Denver is a win away from securing a top-three spot, so the 1-3 seeds are off the table for Miami, unless it wins out and the Pioneers lose out. Which is not realistic. That leaves the fourth spot as the last remaining one for home-ice advantage in the first round of the NCHC Tournament. To round out the field, Western Michigan – especially after the RedHawks’ win on Friday – and Colorado College are virtually locked into the bottom two spots. Meaning Miami will battle UMD and UNO for the four, five and six seeds. Six plays the third-place finisher between UND, St. Cloud and Denver on the road. No thanks. Five travels to the winner of this three-team cluster. In other words, it plays the hottest team of these three on the road. Again, nah. In the scenario in which the RedHawks finish fifth or sixth, they will likely not have the wins necessary to keep an at-large possibility alive, which is why the next 15 days are so important. 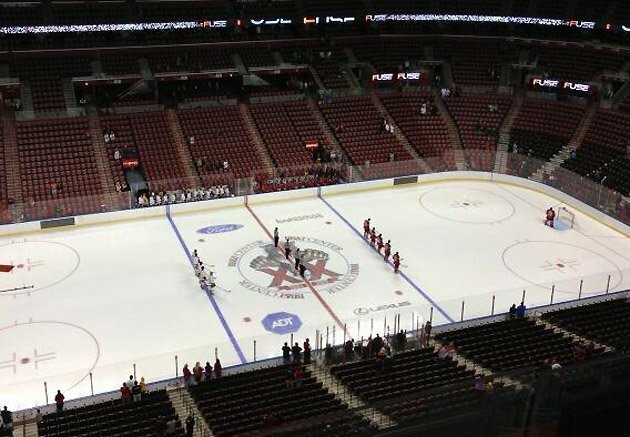 The good news is that Miami is playing its best hockey of the season. More good news is that the other two teams the RedHawks are battling for that coveted home-ice spot face tougher remaining slates. UMD is at North Dakota again on Saturday after losing to UND in overtime on Friday, then it travels to second-place St. Cloud State for a pair of games next week before capping its regular season by hosting Miami. UNO hosts St. Cloud on Saturday after falling to SCSU, 4-1 on Friday. The Mavericks wrap up their regular season with two against North Dakota at home and a pair at Denver. Miami is at seventh-place WMU for one more on Saturday, hosts last-place Colorado College next week and finishes with a series at Minnesota-Duluth. Those opponents are a combined 24-54-9. And if the RedHawks can’t put up a good showing in this stretch run, they don’t deserve NCAA consideration anyway. Winning three of its final five would be just OK for Miami and would probably hurt its PairWise. Taking four would be preferable, and running the table would be ideal. A losing record in this span would be devastating and would likely result in a road trip for a best-of-3 and then having to at minimum advance to Minneapolis for a shot at an NCAA berth. – Anthony Louis scored his eighth and ninth goals of the season on Friday. We’ve mentioned his second-half surges before but haven’t thoroughly evaluated. This is Louis’ third season with Miami, and he has 10 goals in 52 games in October, November and December and 20 in 55 contests in January and beyond. In terms of points, Louis has recorded 32 of his points before New Year’s and 50 after, or an average of 0.62 vs. 0.95. And he has been clutch in the postseason, recording 13 points in 11 games in the NCHC and NCAA Tournaments, including six goals. – This was the 29th game of Miami’s season and the first time the RedHawks have scored multiple goals in the first period. They had just 12 markers in the first 28 opening frames this season. – Jay Williams stopped 27 of 28 shots to earn the win in this game and has been a rock since taking over following GoalieGate. Williams is 7-2 with a 2.11 goals-against average and a .917 save percentage in the nine-plus games since, and that’s with two five-goal games, with both featuring multiple tallies he had zero chance on. – Jack Roslovic and Josh Melnick combined for just one assist on Friday but were still integral to the team’s scoring. Roslovic would’ve gotten third assists for two of the goals, and Melnick’s helper was the direct result of him stealing a puck at center ice and lifting it ahead to Louis, who did his thing to make it 1-0. Roslovic also just missed a goal at the end of the second period, so he’s still making offensive contributions, even if they aren’t showing up on the scoresheet. Check out this bad boy! All we have to say is WOW. 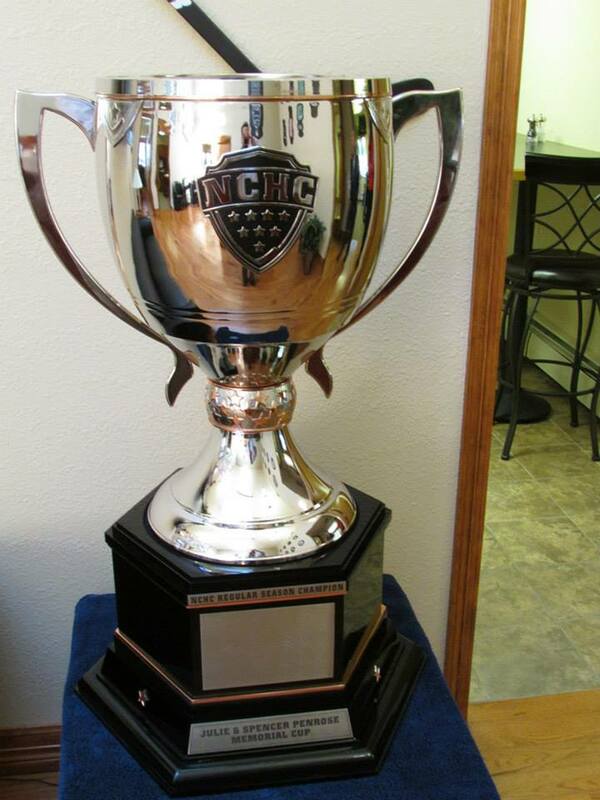 Check out the entire photo gallery from the NCHC’s Colorado Springs Headquarters on Facebook. Ironically, it is #1 Miami and #6 North Dakota this weekend in the first game of the NCHC season. 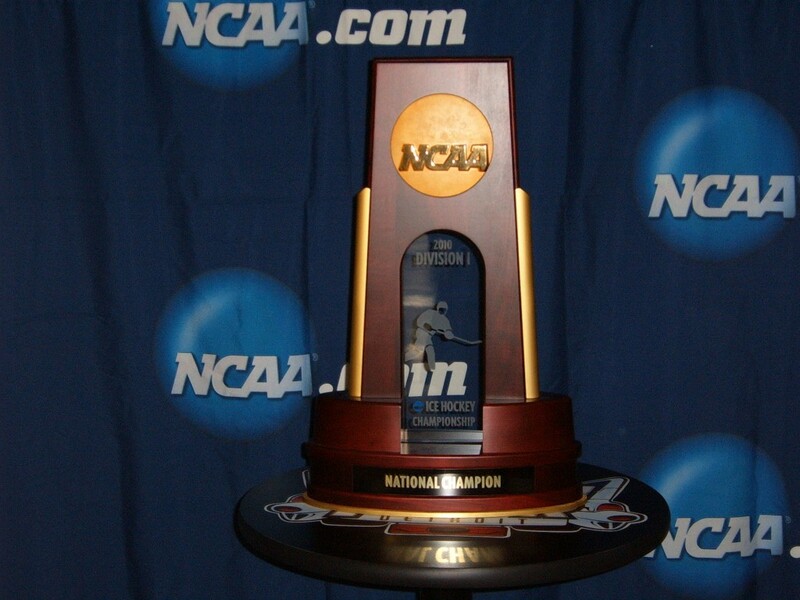 If I was a gambling man, I’d say that these two will battle it out for this – the regular season championship trophy – all season.